Knit rows 1 & 2 until piece measures 6" (7"; 8") from where you started knitting back and forth and you've just finished a wrong side row. 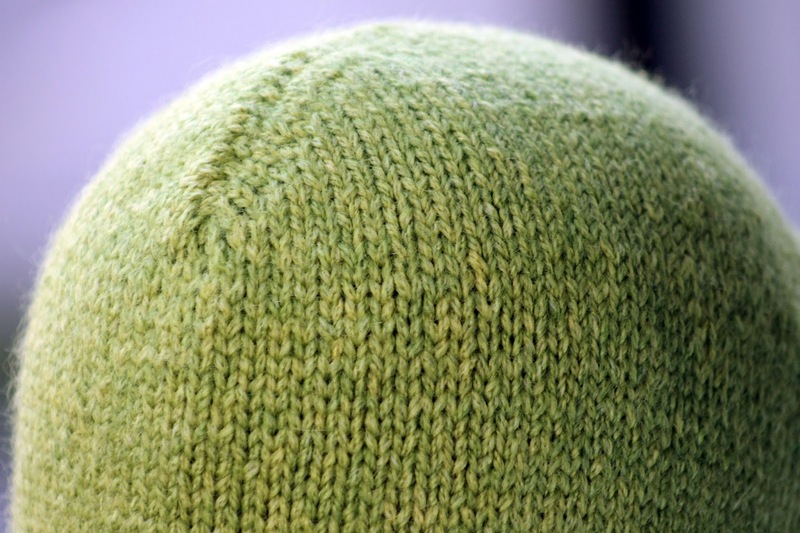 Now we'll begin working short rows to shape the crown of the hat (here's a short row technique refresher if you need one). Since I run my own website and don't risk running out of space, I've given the short row directions for each size separately. So find your size below and work as given! Complete the short rows given for your size. You have now worked both sides of your crown and are ready to seam the top. Therefore, divide your stitches evenly between two dpns and use third dpn to work three needle bind off to seam hood (you can also bind off regularly and seam, or of course use other needles besides dpns to complete it - I just like them because I don't have to worry which end I insert them through for the bind off!). Finally, using your circular needle again, pick up 86 (96; 110) evenly along face hole (in case any of you are as lazy about this stuff as me: the evenly part is important! Place stitch markers or something to keep your sections even if you need to in order to keep track!). Knit four rows around and bind off loosely. 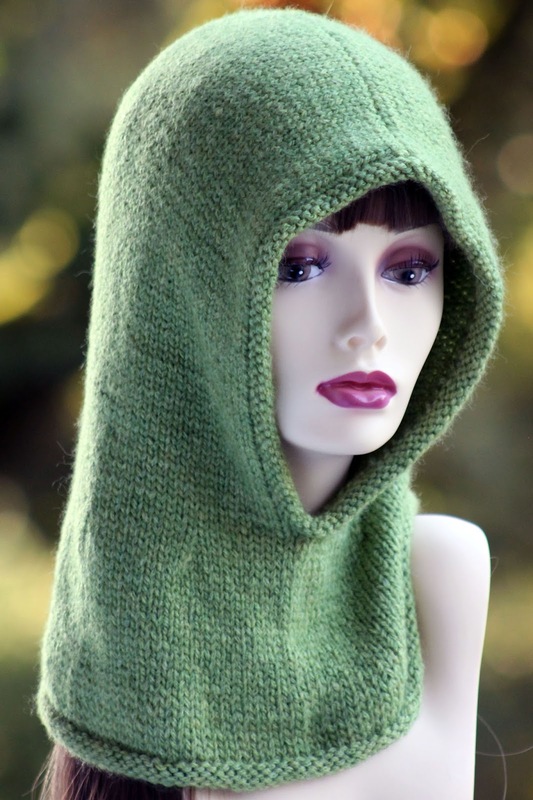 Tuck in ends and block hood, allowing both edgings (at the bottom of the hood and around the face) to curl naturally. And that, friends, is how you make this hood! Thanks! This is a very cool design. I Just shaved my head. I started out for a large.my head messures 21 &5/8 inches, and 23& 7/8 inches from top ofhead to under chin. Can you sugg.how I can adpt to have,a little more fitting head part of hoodie. I love the design. 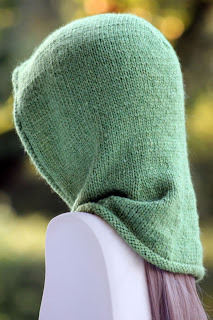 How would it look worn as a cowl and pulled up when needed? Okay photos are up! :) Hope that helps!!! Can I kitchener the top? a Russian lacemaker's join would be my choice. Thanks a lot for the great and very detailed pattern.I wanted to make this for a long time,cant wait to start.Will finish the face part with some fur.All the best and thanks agin. Oh, I have to make one of these. It would niftily solve my problem of a cold neck during the winter. I will redesign it, though, to make it patterned. Thanks for posting this. Glad you like it! :) And I apologize for the delayed response - somehow your comment got stuck in my spam filter!!! This looks lovely. I have an assortment of yarns in my stash that would knit up beautifully into this. What weight is the yarn? I'm in the UK, so is it DK/Aran/chunky? Ack! Easily one of the best colors!!! :) And let me know if you have any more questions!!! Love this!! Such a cool take on a hat to keep warm....and when it's too warm you don't have to carry it!! Can't wait to knit this. Awesome now I know what to do! What a magic hood girl well done on the design! Regards Martine. I don’t understand the short rows and I did check out the page mentioned above. It seems like I keep going back and forth on just one side of the hoood. This isn’t working. I just finished knitting this and love how it turned out! Thanks for the great pattern. I don't normally do hats or cowls, but this I like. It will probably work great for those days when I have to shovel snow or pop in and out of stores. I think I'll make this up in colorwork with to different yarns for some textured interest. Thanks for sharing. Glad to hear you like the pattern! It is, indeed, meant to be practical! :) Anyway, let me know if you have any questions!!! Help! This is my 1st time doing short rows. I've checked out the link you provided on it. Row1: K44, then wrap & turn on the 45th stitch? Row 3: K43, and then what do I do with stitch 44 & 45(with the wrap)? Am I understanding the instructions correctly? Hi there! First off, I understand: short rows can be confusing at first! Basically, there are two steps to doing them: first, you knit (or purl) as many stitches as you need, then you wrap the stitch just beyond those stitches so that you don't get a hole in your work. Which brings us to the second part: dealing with the wraps when you reach them again. Basically, you lift the wrapped parts onto your needle with the stitch that they wrap and then knit (or purl) the wrap and stitch together (you can see the instructional page for more details about how to lift them). 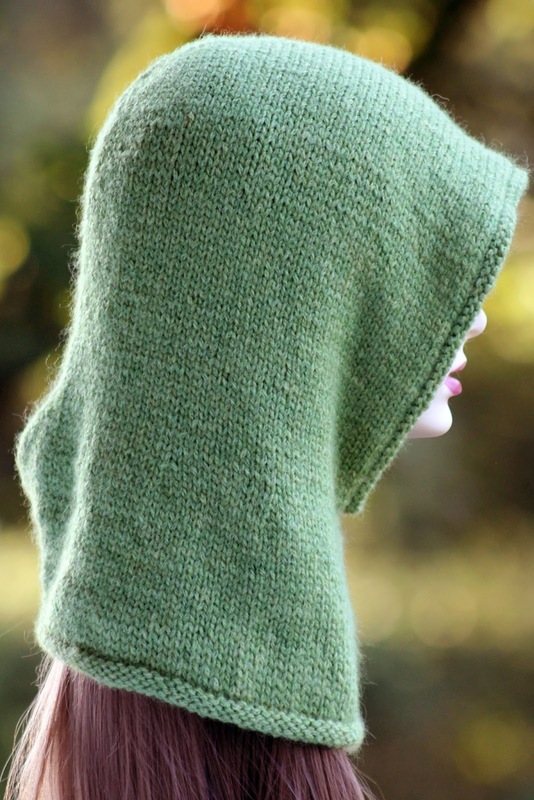 In this particular pattern, you won't have to deal with any of the wraps until you're knitting all the way across at the end of each side of short rows, so you don't do anything with the wraps on row 3, since you won't even knit that far across. Hi. I don't understand row 25 for size L. Up until now the only way I've knit short rows is in socks by picking up one wrap per knit or purl row. In row 25, do I pick up all the wraps in one row or do I only knit the non-wrapped stitches and deal with the wraps only when I do the finishing seam/bind off? Glad you like the pattern. :) Let me know what size you'd like to make and your specific gauge and I can help you with some modifications! I love this pattern! But I'm beginner I wish you can find time to make video tutorial please? Thank you! Love this one Gretchen. Perfect for the winter. How did I miss seeing this one before????? I don't know, but I'm glad you're seeing it now! :) Glad you like it!!! A friend has been looking for something like this for quite awhile, but didn't like the look of a hood with a 'pointy' crown. I forwarded this link to her and - as if by magic - a lovely hand-painted Malabrigo has been acquired, and the project is already in her mum's queue. Thanks! What's the advantage of knitting short rows rather than knitting all the way across, decreasing two stitches in the middle of each row? 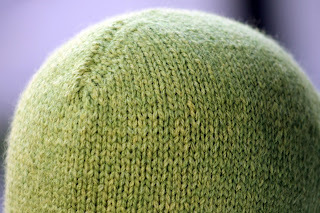 how do you go about picking stithes up along the face hole to knit? is there any tutorial you would recommend that might help me better visualize what to do at that point in the pattern? thank you! Can I use mohair yarn for this pattern? I’m a fairly new knitter, and I’m afraid I’m stuck. I’m in the two transition rows before you start the short rows. I only have one stitch marker on my project, and that’s where my round starts. After a couple of rows of each one and two, there’s a kind of a gap or notch where my stitch marker is. Have I already messed this up? Please help! Thank you. I sent a pic to your email address. It is just a slit, or a small gap. I just worked back and forth from the one stitch marker I had on my project. Thank you so much! I love this pattern! I just started the short rows. At the beginning of the short rows, are we just supposed to be working on one side of the face opening? Thank you so much! Yes, first you work one half, then the other! :) Let me know if you have any other questions!! 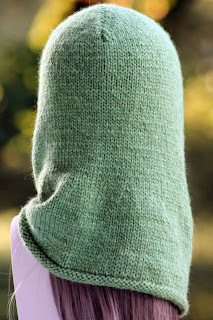 I love this pattern, I use it as a reference every time I want to knit something with a hood and want a rounded crown. And thanks to your pattern I discovered how amazing and useful short rows are. Thank you so much for this wonderful pattern! Oh, I'm so happy to hear that! :) And short rows are pretty amazing, too. 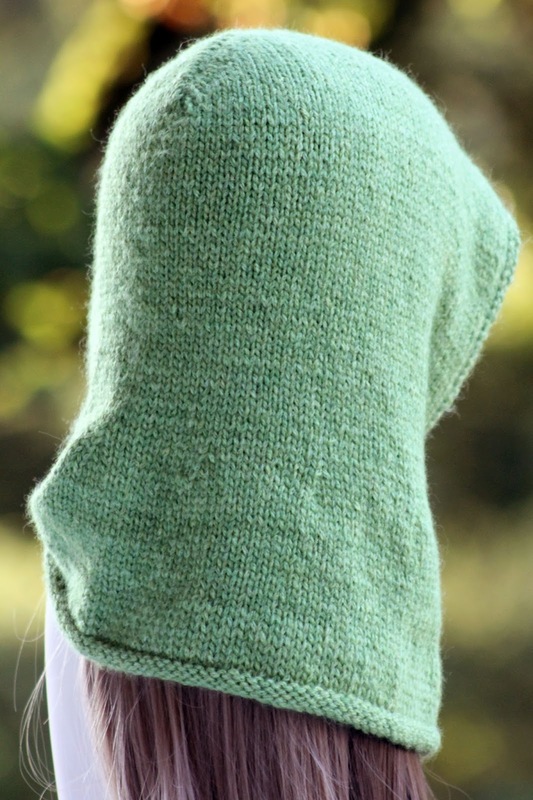 Can you tell me how I would adjust the pattern if I used a lighter worsted rather than an aran weight yarn? Thanks. I should add I want to make a size medium. I am certainly happy to make some suggestions, although I'll need the exact gauge of your yarn! :) You might also consider holding two strands of your desired yarn together; that might bring you closer to this gauge as well. Complete the short rows. You have now worked both sides of your crown and are ready to seam the top. Therefore, divide your stitches evenly between two dpns and use third dpn to work three needle bind off to seam hood (you can also bind off regularly and seam, or of course use other needles besides dpns to complete it - I just like them because I don't have to worry which end I insert them through for the bind off!). Finally, using your circular needle again, pick up 64 evenly along face hole. Knit three rows around and bind off loosely. 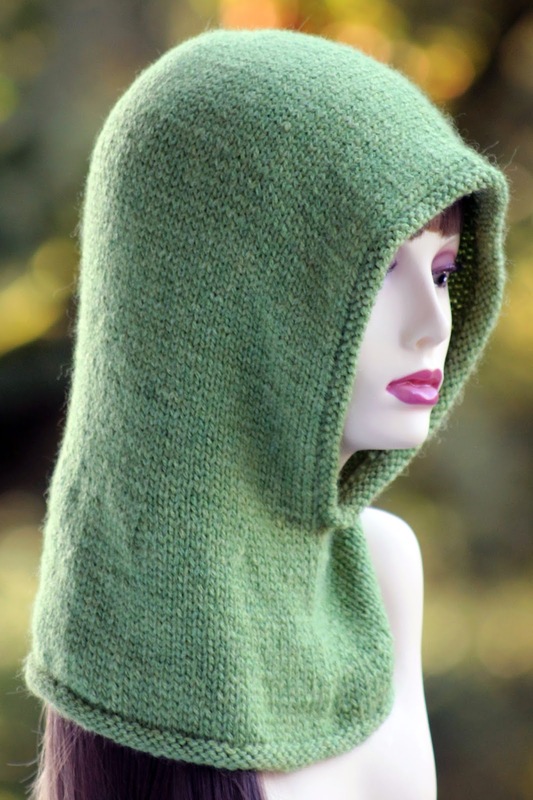 Tuck in ends and block hood, allowing both edgings (at the bottom of the hood and around the face) to curl naturally. Love the pattern! I've gotten to the final step-do I pick up the stitches at the opening for the face on the right side and plan to have the rolled edge cover the seam, of on the wrong side? 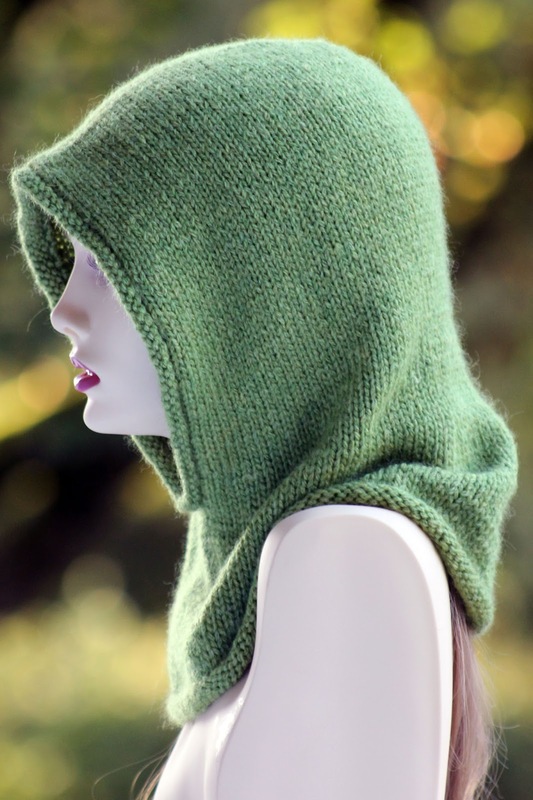 I was planning to make a second Betty Bonnet because I've worn it more than anything this year, but when I noticed this hood I was impressed with the shaping--I don't like pointy hoods. I have just the yarn for it. I'm sure I saw that someone had added a cable up the side and wanted to try that, but I'm not sure where to start it at the bottom--like a stitch count so that it ends up framing the face. How would I determine that? Thanks so much--love your creative headgear! Thank you for the speedy response! So I'd probably aim for maybe two stitches beyond the marker to start a purl band. It will be interesting to follow a chart written for a flat object executed in the round and then flat. The one I'm planning has both a right and left version. I know some sort of reversal will be required. The cable I have in mind is one of Elsebeth Lavold's from Viking Knits. I think it will suit the project. Thanks again! That sounds very lovely - it sounds like the cables will mirror each other on either side of the face! Anyway, good luck, and let me know if you have any other questions!!! I've done short rows before, so I get the wrap & turn part, but in the instructions would there be two complete rows between Row 2 and Row 3 where you knit the wrap and its stitch together and then complete the row and purl back before starting short Row 3? Based on the graceful curve of the crown that would be my guess. OK, so you work one side completely, so you have a wedge insert, and then work the other side and finish. Sorry, I have the flu and I probably shouldn't even knit when I'm feverish. Also, had a migraine today! Thanks for your patience. You don't even want to hear what my three year old says... Since we live in Switzerland we hear unedited English music in the grocery store, and ten year olds swear in English on the bus. And my darling child has quite a mouth!!!! After knitting half of the crown in short rows when it says to knit the whole next row should I just knit normally or knit with the wraps kww? Just found your lovely, elegant pattern. I love the short row shaping that leads to the three needle bind-off. Most hood patterns I’ve read involve sewing and I just “hate” to sew. Thank you for this terrific pattern! So glad to hear you like it! I hate to sew too. ;) And let me know if you have any questions!!! I love this hood and have made two already and am working on a third, but I’ve noticed that the opening is always a bit big and it leaves my neck too exposed. The rest of the hood fits fine though. I tried knitting 6 inches instead of 7 but it still was too big. Do you have any suggestions on how I can fix this to fit better? Love this pattern. Going to give it a try. Hope mine turns out as good as yours. Have a couple of granddaughters that I think would love to have one. Thanks for sharing! 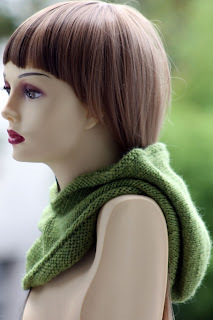 Gretchen, what is your row gauge for both the original pattern and the bulky pattern? I love this hood! I am ready to add the stitches around the face hole on my large hood, but somehow I only have 36 rows to work with. Shall I just continue with 72 stitches around, or should I try to add in one stitch at a regular interval to get a total of 110? Thanks for the quick response. My opening is about 24.5 inches in circumference. I'm fairly new to knitting, so my gauge isn't perfect. When you say 'pick up 3 stitches for every four rows' does that mean cast on 3 stitches in 4 rows? I'm always happy to help. :) And here's what I mean: When you're picking up stitches along the edge of your knitting, you're usually picking up stitches that will be knit perpendicularly to your existing knitting (if you were picking them up to travel in the same direction, you would have just kept knitting in the first place!). In that case, you're picking them up at the edge of a vertically knit piece. Typically, but not always, that translates to about 3 stitches added along the edge to every four vertical rows. I'm not sure if that makes it any clearer, though... I can try to track down a video if that would help more! OK. I get it now and should finish this tomorrow. It has been super fun to knit! Hi Gretchen. I'd love to this in the small size for my four year old granddaughter. However my yarn is worsted weight with a gauge of 20 stitches to 10cm/4" using 4.5mm (US 7) needles. Have you any idea how I should adjust the pattern or change needle size to achieve the correct size with my yarn? So excited to have finally found a pattern with no point. Am semi familiar with short rows but want to be sure (as to prevent having to rip half apart), that I am clear on your instructions. In reading others questions/replies... You've stated.a)no need to deal w/any if the wraps until you're knitting all the way across at end of each side if short rows. So, don't do anything w/the wraps on row 3. Guess my question. Is: when and where would I pick up wrap.? Love this pattern. It pays to never give up!